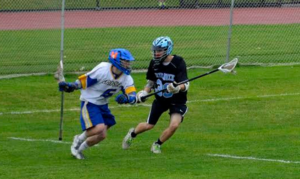 I received a Division I Lacrosse scholarship by accident…said no one ever. As I watch the MLL and high-level college lacrosse on TV these days, it occurs to me that every player I’m watching, to the last man, has put in the time, effort, and focus required to be truly good at the highest level of the game. Many young players I talk to believe that mastery of their chosen sport is predestined, or that some kids just get lucky in the genetic lottery…but I know better. 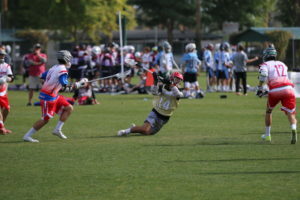 Raw talent and athleticism can dominate a 7/8th-grade lacrosse game, and we’ve all seen that in action. When you get to higher levels, however, the players that are putting in the work to improve their game quickly catch and surpass these “naturally good” players who don’t put as much work in to get better. Players who are building their strength and endurance in the offseason, who never let their stick go untouched in any given week, who show up to practice to train hard, and who take care of their health and nutrition habitually eventually rise to the top. We’ve all heard the stories about Michael Jordan being cut from his high school basketball program as a freshman, Steph Curry getting very little interest from college coaches, and Tom Brady being drafted in the NFL’s sixth round, 199th overall. If they simply accepted these circumstances and believed they just “didn’t have it”, where might they be today? Certainly not among the greatest performers their sports have ever seen. How many times do you catch yourself saying “I just ran out of time today,” making an excuse for why you didn’t go to the gym, or go for a run, or hit the wall for some stick work? I know I have. Well here is your solution… get up early, perhaps 5:00/6:00 am, and get it done first. I promise you all Fortune 500 CEO’s and Olympic athletes don’t sleep in or watch 4+ hours of TV a day, or waste hours on social media. Think about it, do you want to be someone who reads about other people’s greatness or do you want to be someone that others read about your greatness? You decide. I think you will find that the morning calm before the world wakes up is a magical and spiritual time, and there is no greater feeling in the world than heading off to school, or your work day, knowing that you have already achieved something great… a long run, gym, or yoga class. Opportunity is defined as “a set of circumstances that makes it possible to do something.” I am sure you all are recognizing the big opportunities– invitation to a recruiting camp, showcase, etc. But let’s really break it down and focus on the little opportunities that you may be overlooking that have the greatest impact. The opportunity to hit the gym with your parents or friends, the opportunity to play in a box league, the opportunity to reach out to a local collegiate player to train with them, the opportunity to stay late after practice and help a teammate or yourself work on your dodges, or stick handling, or shooting. It is these little opportunities that will raise your game immensely. Gen. Colin Powell, former Secretary of State said “If you are going to achieve excellence in big things, you develop the habit in little matters. Excellence is not an exception, it is a prevailing attitude.” What he means by this is that if you are going to succeed on the grander scale you need to first succeed on a smaller scale. Start your day with making your bed. It is a little achievement but it is nonetheless an achievement and a start. Look back and see how many actions you were able to cross off. This is accountability, and I promise you there is no one in your life that is going to force you to do anything. Your parents are great advocates of yours, along with your friends and teammates, but at the end of the day, the only person that can make you get up and run farther, or faster, or do a third set of squats IS YOU. This is a true testament to how bad do you want to be great? I guarantee all those lacrosse players you are watching on TV seldom had to be told to run harder, run farther, or lift more. They do it because they want to be great! Fuel. Cars need it to run, engines machines need it to run, and we ABSOLUTELY need it to run. But you have to remember that it needs to be the right fuel. If you just went to the gym and worked out hard, then reward yourself with a healthy snack and some hydration. Don’t ruin everything you have achieved in the gym by getting drive through after. That is being counterproductive. Remember that you are an elite athlete and may look a little different than your non-athlete friends. I am here to tell you that more is OK! You are strong and fit, and your body needs more because you are burning more. So don’t feel bad about finishing your whole sandwich, yogurt, apple and peanut butter, Cliff bar, banana, and huge water. You needed it! Because at the end of the day, if you thrive at the first three–getting up early, seizing the opportunity, and being accountable, then you will never reach your potential if your body cannot keep up. Eat healthy, eat often and hydrate all the time! Be that person in the class that always has a water bottle with them. Highly successful athletes have bad days too, but they never give a bad effort or let themselves dog it through a drill or practice feeling sorry for themselves or making excuses. We’ve already talked about seizing opportunities, but what if your opportunity comes on a less-than-ideal day for you? Mental fortitude is another trait that is not inborn but learned and trained. It’s an everyday attitude that is built through a consistent level of effort, regardless of the circumstances. I could recite a long list of things I heard from Coach Emmer over my four years at Army, but the lesson it left us with is that you cannot let outside factors affect your mental and physical preparation to meet your opportunities to excel. Try to use the energy from all the frustration or stress to fuel your focus during your training session or event…every thought you entertain that does not feed your success actually hampers it. Remember, practice doesn’t make perfect…perfect practice makes perfect. Whether you fall into the “natural talent” category or not, success at the highest levels of anything in life will require your time, effort, and focus. Make yourself better at every opportunity, and enjoy the growth you’ll achieve, knowing that you’re ready for your opportunity when it presents itself. It’s truly just up to you…do you want to think about the excuses you have or the success you want? How involved should your coaches be in the recruiting process? How important is their recommendation/opinion? What qualities should I look for in a good coach? Our 2nd episode features Ryan Thompson (former college baseball player and MLB Scout) and Andrew Beinbrink (Former All-American & MLB Player) discussing just how much the recruiting process has changed in the last 10 years. What’s the best route to take when considering college? What are the best strategies to undertake? Am I doing enough to get noticed by college coaches? We would like to congratulate Ryan Friedman on his commitment to Hamilton College! Here is Ryan’s recruiting story and interview after his commitment. Good luck as an Alex! 2. What school are you going to, and why did you choose them? I am going to Hamilton because they have a beautiful campus, very strong academics and an open curriculum as well as a dedication to athletics as part of NESCAC. SportsForce helped educate me on what colleges I should consider myself a prospect for as well as what kinds of schools they were. Chad Hadlock, who helped me personally as an advisor with SportsForce regularly gave me advice on how to approach any aspect of the process from skill specific workouts to how to show myself at tournaments to how to speak to college coaches on visits. SportsForce also helped me maintain relationships with all the coaches I was interested in playing for as well as reminding them where and when I will be playing. I think highlights and early communication certainly help, however some players develop later than others, such as myself; make sure you are doing the things necessary in order to catch a coach’s attention. I’m very excited! I could not be more pleased with the school I have committed to. 6. How much money do you anticipate your family saving in college expenses because of you being recruited ? If I had not been recruited I would likely not have known about this school, which is going to be giving us a large amount of financial aid, which I may not have received at a different institution. Likely several thousand dollars per year. Yes they help you remain relatively stress free during the process and help maintain your confidence as a prospective athlete. They also help keep you very organized and make sure you do not lose track of any communication or interest from college coaches. Our partner Matt Hunt from College Hunt helps students successfully navigate the college selection process. In his latest blog post he explains the new NCAA academic requirements for Division 1, 2, and 3. Planning on, or dreaming to one day participate in NCAA Athletics? 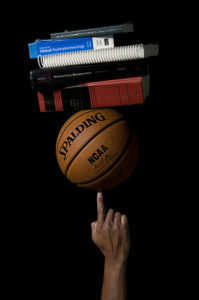 Before you step onto the field or court you must first complete the required academics to be eligible for participation. Beginning in August 2016 the NCAA is increasing the minimum academic requirements student-athletes must meet to participate in Division 1 and 2 athletics. While these changes may seem minor, it’s important to remember all students planning on playing Division 1 or 2 athletics must meet these requirements or they will be academically ineligible. Before we dive into the specific academic requirements we should first understand the purpose of the NCAA Eligibility Center. Think of them as the checks and balances for coaches as well as colleges/universities on whether or not the student has met the established requirements. Keep in mind, they are separate from admissions; a student still applies to individual schools during senior year. A common misconception from students is they believe if they’ve met the NCAA Eligibility requirements they are good to go, but in reality, they have only met the standard to play. What is a Core Course? The NCAA Eligibility Center requires students earn a specific number of Core Courses by a certain point in high school as part of meeting eligibility. Now, there are some differences in the amount and timeline per level (D1, 2, & 3), but the definition of a Core Course remains the same. A Core Course is one that counts towards graduation in the core curriculum: English, Math, Natural or Physical Science, Social Science and World Language or Comparative Religion. Students must earn at least a D or higher in these courses. I know what you’re thinking, the NCAA allows D’s? Correct, but remember four-year colleges and universities do not. The NCAA Eligibility Center has clearly defined specific academic requirements for Division 1, 2, and 3. Here is a breakdown of those requirements for each Division…. Division 1: minimum 2.3 GPA, increase on the SAT & ACT sliding scale, 10 of the 16 core courses must be met before the start of senior year. Division 2: minimum 2.0 GPA, combined 820 on SAT or sum 68 on ACT, & 16 core courses completed. Division 3: the college or university, not NCAA Eligibility Center, determines eligibility for admission, financial aid, practice and competition. What happens if a student fails to meet the academic eligibility requirements? It will first depend on which division they’re being recruited by and how they’ve missed the requirement. The results may range from delayed opportunity to play, having to sit for an extended time or worse- being ruled academically ineligible. Remember, the number one focus should be earning successful grades throughout high school to meet the requirements to play and more importantly too give yourself the opportunity to earn admissions into the college or university you’re desiring to attend. For more information about the college selection process check out his blog! We would like to congratulate Marcus Yandall on his commitment to Elmhurst College! Here are Marcus’ recruiting story and interview after his commitment. Good luck as a Bluejay! The process was very long but was very exciting at the same time. Towards the beginning of high school I was so set on playing at a division 1 school, until I realized all of the advantages of attending a smaller school at the division 3 level. On August 25, I verbally committed to Elmhurst College. I committed to Elmhurst College because I felt like it was the best all-around fit for me. I fell in love with the city of Chicago, the opportunity to be a part of the honors program and be involved in the biology program to prepare me for medical school, and the environment that coach Morrell and his staff are creating at the school was very intriguing. SportsForce definitely played a huge role in my recruiting process. It opened up opportunities with the schools that ended up being in my top 10 and allowed me to get in touch with coaches in a simple way. Also, the player profile that SportsForce sets up on their website for you helps a lot and makes it easy for the coaches to see everything they need from you in one setting. I would definitely recommend starting early and not being afraid of reaching out to college coaches. With kids as young as 8th grade committing, getting a highlight video out to coaches as early as possible is definitely a good start. Also, getting in contact with coaches of schools that you think you want to pursue is key; if they don’t know you, you have no chance of playing at that school. I am extremely excited to be attending Elmhurst College next year. 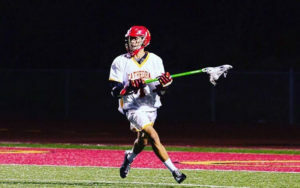 Living in Chicago is going to be a lot of fun and getting a great education at a high-achieving school and playing lacrosse for a program that is headed in the right direction are just a few of the exciting factors. I anticipate my family saving a total of around $80,000 over the course of my 4 years in college. I would recommend SportsForce to any athlete looking to play a college sport because of all of the help their service provides. SportsForce really makes sure you end up at the best-fitting school and provides you the tools and resources you need to easily make contact with the coaches of your choosing.